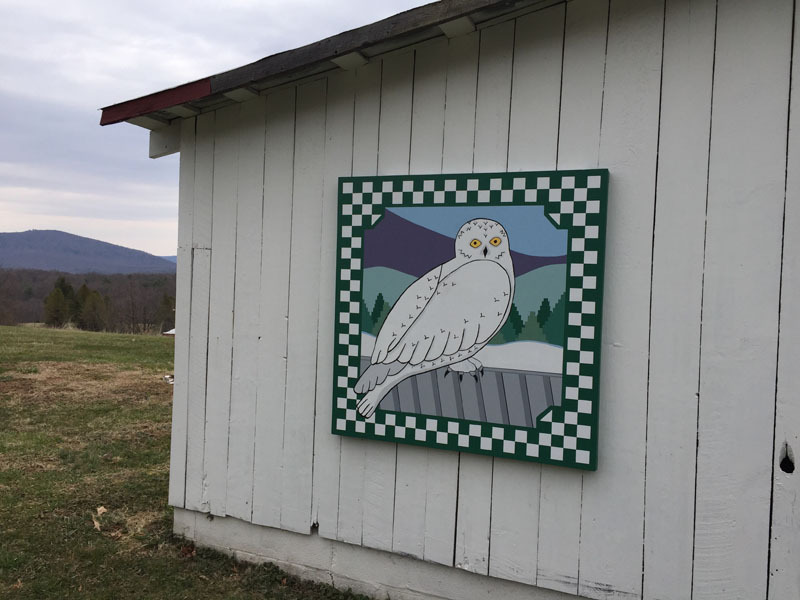 This quilt block was designed and painted for Edith by her daughter-in-law to commemorate the arrival of a snowy owl to her barn roof in December of 2013. The snowy field, trees, ridge and mountain represent the view shared by Edith from her back porch and by her snowy visitor on that special December day. An avid back porch bird watcher, Edie can often be found, bird book and binoculars at hand, sitting on the back porch of the Clear Ridge Farmhouse she and her husband John purchased from Gene and Frances Barnhart in 2001. Bought with the idea of using it as a weekend retrea and hunting cabin for her three boys and their families, it soon became apparent that they never wanted to leave, and the farm became their permanent home. From the vantage point of the back porch there’s much to see as your gaze moves from the hummingbirds battling for a turn at the porch feeder to wild turkeys slowly moving in the fields below the barn, whitetail deer feeding along the edges of the woods bordering Plum Hollow, and eventually over numerous ridges, across the turnpike, and up the slopes of Gobbler’s Knob. In December of 2013, Edie was shocked and thrilled when kind strangers knocked on her door to let her know that a Snowy Owl was at that very moment sitting on her barn roof! According to a recent article in Penn-Live, with the exception of the winter of 2013/2014 when a drop in the lemming population of the arctic tundra led to some 4000 snowy owls visiting the state of PA, the average number of snowy owls that visit PA in any given winter is about 10. This sighting caused quite a commotion as numerous people were called to “come and see.” In spite of all the activity going on below, the arctic visitor was content to remain for several hours. Edith says, “I will never forget the sight of that owl, perched on top of the barn roof, its white feathers blowing in the wind!” When her eldest son’s wife, Anne, offered to design and paint a quilt block as a gift, Edith knew exactly what she wanted the theme to be. The barn quilt was painted on the kitchen table of the farmhouse. This made it possible for Edith to watch the process as she recovered from her first, and long overdue, knee replacement surgery. Like the snowy owl, she had also chosen to venture into unknown territory in the hope of a better tomorrow. Just as the quilt inspired her to get up and walk to the kitchen to check daily progress, she inspired her family with her bravery and determination to go through with the surgery and complete the rehabilitation process. Edith and her husband, John, were both raised in Fulton County. Edith’s parents were Emanuel and Beatrice Walker. She, her brother, Nelson, and her sisters, Naomi, Ann, and Bonnie, were raised on a dairy farm near the present Forbes Road School. Her husband John, and his sister Joyce, children of Elder and Marjorie Gallaher, were raised just a little further down Clear Ridge Road from her current home, near the Clear Ridge United Methodist Church.